Short story collections are something I've been trying to read more and more of in recent years, because if a writer gets short stories right they can be exquisite. That there are so many collections out there based on fairy tales, myths, legends and folklore is brilliant for someone like me who absolutely loves retellings and old, local stories. This collection, the author's debut, promised a collection of stories inspired by Cornish folklore, so I knew I had to get my hands on a copy the minute I first heard about it. I'm from the UK and I'm lucky enough to have been to Cornwall a couple of times; it's one of my favourite places in the UK because it feels like its own little world, like the hidden corner of England, and it's bursting with fascinating history and folklore galore. When I think of Cornwall, I think of smugglers, mermaids, giants, piskies and King Arthur, so I couldn't wait to dive into this collection when I visited St. Ives last year. 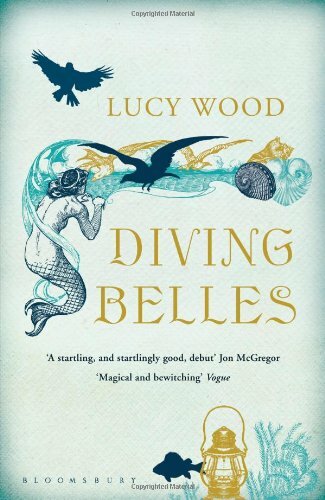 That I only finished Diving Belles recently probably tells you what I thought about it. Sadly, I was very disappointed. Now in fairness to this book last year was a rubbish reading year for me, which definitely contributed to me putting it down, but the main reason was that this collection left me with very similar feelings to how I felt when I finished Karen Russell's St. Lucy's Home for Girls Raised by Wolves (reviewed here). Most of the stories didn't really seem to go anywhere, and while I understand short stories aren't necessarily plot-driven in the same way novels are, I still would have liked some sort of plot, some sort of reason for the story to be there other than that Wood got an idea that she didn't quite know what to do with. The sad thing is I can't fault Wood's writing. This woman can really write, some of her descriptions in this collection are exquisite, but personally I like story; when I read a collection of short stories, I want a collection of short stories - not a character study or something that feels like an extract from something longer, which so many of these stories did to me. Like Russell's debut collection, I felt as though Wood wasn't sure how to end most of the stories in this collection so, instead of coming up with an ending, she simply stopped writing and it left me feeling cold. I also had an issue with the inspiration behind these stories. If it weren't for the fact that it's mentioned in the blurb, I never would have guessed these stories were inspired by Cornish folklore. Sure, I associate giants, mermaids and little people with Cornish folklore more than any other - though my favourite story in the collection, 'Blue Moon', set in a retirement home for witches, featured folklore I associate more with Wales than Cornwall - but these stories could have been set in any coastal UK town. I currently live in one myself, and her descriptions of the coast felt so generic to me that these stories could have taken place down the road from my house. This is a real shame considering Wood grew up in Cornwall herself, so I was expecting Cornwall to seep through the pages. The folklore was certainly Cornish enough for me, but I would have loved to have seen Wood play around with Cornish dialect, to mention specific place names that really centre the reader in a time and place. I wanted to see mentions of St. Ives and Bodmin and Zennor and Lizard, not description after description of the sea. Her descriptions were beautiful, they just didn't sing Cornwall to me in the way I was expecting them to. I was also frustrated to see this collection being compared to Angela Carter. Now that is neither the book's fault or the author's, so I'm not actually holding this point against my rating, but I wanted to mention it all the same because it seems like every fairy tale or folklore-based collection I pick up is being compared to Carter. Just because something is a retelling or is inspired by an older story doesn't mean it's The Bloody Chamber and Other Stories. It's unfair to new and emerging authors, who are constantly being compared to someone who is considered a literary great, and it's unfair to Carter - The Bloody Chamber and Other Stories is probably her most famous work, but that's not all she was. She played around with Shakespeare and her commentary on gender and its fluidity is fascinating, so let's stop narrowing her down to one body of work, shall we? Also, this collection isn't like The Bloody Chamber and Other Stories at all. Wood's stories are quiet, creeping stories that use the fantastical to highlight just how mundane normality is, Carter, on the other hand, wrote about mothers riding on horseback to save their daughters from homicidal husbands, women who can be licked into tigers and maids who are robots. I really don't think there's much comparison to be had. So, if you like slow stories that aren't plot-driven, this book is for you. I wish I was sophisticated enough to love a book like this but I love a plot and there wasn't enough of it here for me. Having said that, I'd still recommend picking this up if it sounds interesting to you because Wood's writing is lovely and she's definitely an author I'm going to keep my eye on - she has the potential to be fantastic.